Does your car have transmission problems? Does your vehicle have any of the following transmission symptoms? Is the overdrive light on? Is the service engine light on? Does your transmission make any unusual transmission sounds? Does the transmission not shift smoothly? Is your vehicle sluggish or losing power? If any of the above symptoms fit your vehicle, you may be having transmission trouble. Call us today. Our ASE certified and ATRA certified technicians will help you understand your vehicle’s symptoms. 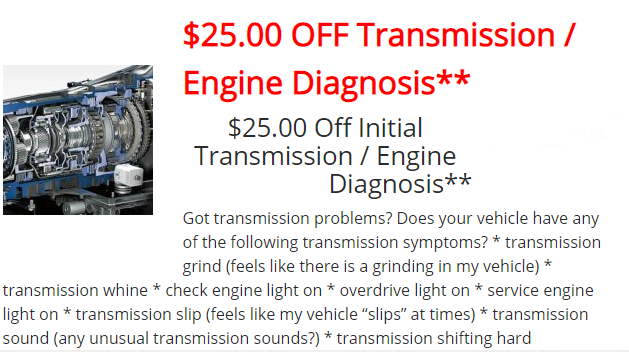 **Up to $25.00 Discount applies to diagnosis only. Cannot be combined with any other offer(s).